reserve for our Corps which is now in its position on right of 20", the left center. Heavy shelling by both sides in afternoon. 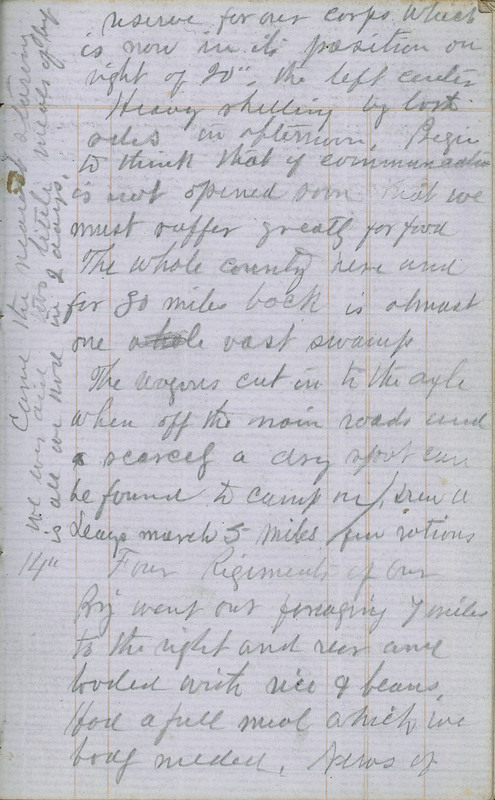 Begin to think that if communication is not opened soon that we must suffer greatly for food The whole county here and for 30 miles back is almost one vast swamp The wagons cut in to the axle when off the main roads and scarcely a dry spot can be found to camp in, Drew a Days march 5 miles few rations. 14" Four Regiments of our Brig went out foraging 7 miles to the right and rear and loaded with rice & beans. Had a full meal which we long needed. News of (Vertically. at left:-) Came the nearest to starving we ever did two little meals of beef is all we had in 2 days.